If you’re looking to start matched betting, learning what a lay bet is – and how to place a lay bet – is an absolute necessity. Every single bet you place will involve laying bets off. The process sounds a lot trickier than it actually is; it’s extremely easy! Firstly, you’re going to need to be signed up to a betting exchange such as Betfair. If you haven’t already joined them, you can do so here. Betfair – on their exchange – allows you to bet AGAINST results. Instead of betting on Arsenal to win, you can choose to bet against Arsenal to win. In that situation, you’ll win your bet if Arsenal draw or lose. This process – betting against possibilities, is known as the LAY bet. Betting against an outcome, is laying that bet. So in the example previously, you would be LAYING Arsenal. To newcomers, that image probably looks like a complicated form of sports stock exchange. Well, that’s not too inaccurate, really. But it’s a lot more simple to use than a stock exchange, that’s for sure. To place a regular bet on your chosen selection, you’d click the blue box. Just like using a betslip at a bookmaker; click the blue box, enter your stake and then click ‘Place bet’. To place a lay bet, you’d choose the red box. The process after that is almost identical to the above. The other boxes aren’t all that important – they do serve a purpose, but you don’t need to worry about them at this stage in your betting journey. 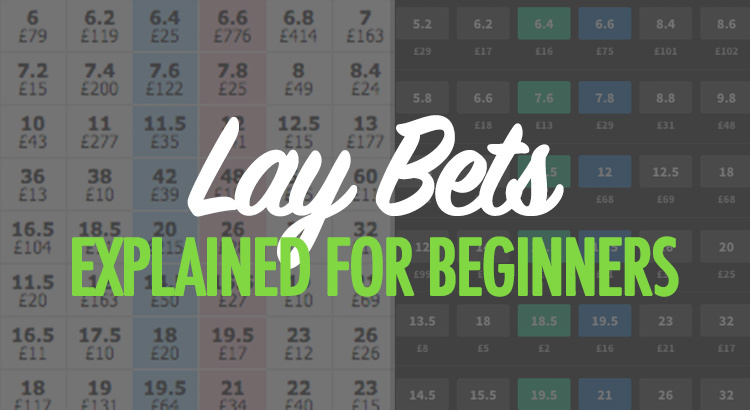 Why do you need lay bets in matched betting? In matched betting, every bet you place will need to be laid off. You do this using a matched betting calculator, and you lay off every bet so that you never lose any (or much) money on each bet; usually it’s just a few pence. By laying off bets, you can qualify yourself for free bets with very, very minimal investment up front. How does a £25 free bet sound for the price of 20p? Better still, you can lay off your free bet too – again using the calculator – ensuring you guarantee an 80% profit minimum on every free bet. When you place a regular bet – let’s say you want to bet £10 on Lionel Messi to score the first goal in Barcelona’s next game – the money you are risking is easy to see: £10. £10 is the most amount of money you can lose on this bet, regardless of what Messi’s odds are to score first. However, when you lay a bet, things work the opposite way round. If you lay £10 on a bet, you’re actually aiming to WIN £10. The amount you could lose – your liability – is £10 multiplied by the lay odds. You then add your £10 stake back on. The odds to LAY Messi as first goalscorer is 4.0, so your liability is £30. The money you stand to win is £10 if he doesn’t score first, minus commission from the betting exchange. Of course, you’ll never actually lose the £30 when matched betting, because you’ll have also backed Messi to score on another site. Where can you lay bets? You can lay bets on any betting exchange. Unfortunately, these aren’t available in every country in the world. Unfortunately (again) we’re unable to provide a full list of every country in the world that does and does not have access to betting exchanges, so the best thing for you to do is to check for yourself. If you do not have access to betting exchanges, your matched betting journey is not over. You just have to do things slightly differently; making use of the dutching technique, rather than backing and laying.